State Bird Provisions has been the hotspot in San Francisco since their opening back in 2012 and earned a Michelin star in 2014. State Bird Provisions, a New American/Californian cuisine restaurant, is so popular that they are booked for two months straight! Therefore, getting a reservation here is almost impossible but the restaurant does keep a portion of available seats open for walk-ins. The downside of walking in the restaurant without a reservation is that there might not be any open seats available. 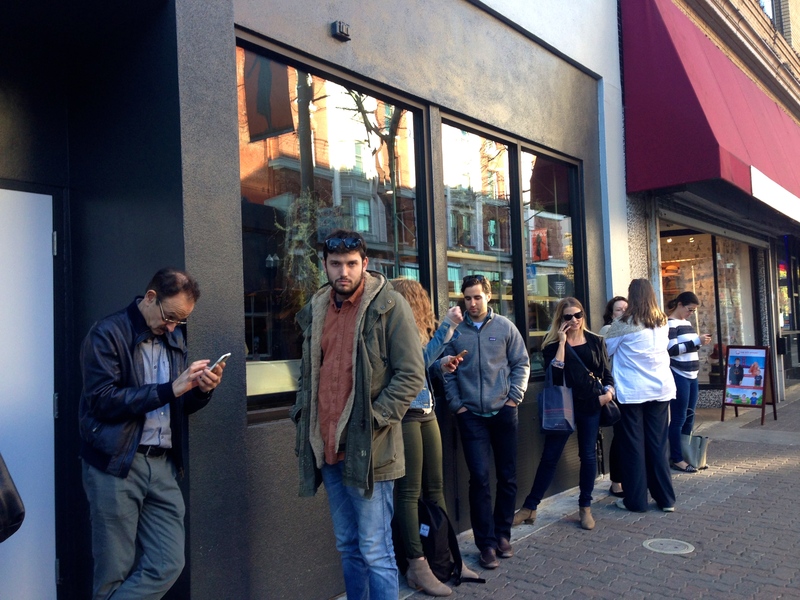 Therefore, people start lining up outside the restaurant as early as 4:00pm to get in at 5:30pm when the restaurant opens! Since I couldn’t get a reservation, the only way to get in was to wait in line. So yesterday Tommaso, my dad, and I headed to the city early to make sure we got seats. We arrived at the restaurant at 4:05pm and there were already two people in front of us! The wait itself was surprisingly not bad since we were talking to other foodies in line and exchanging information about restaurants in the city but also around the world. At exactly 5:30pm the restaurant doors opened and we were seated immediately. 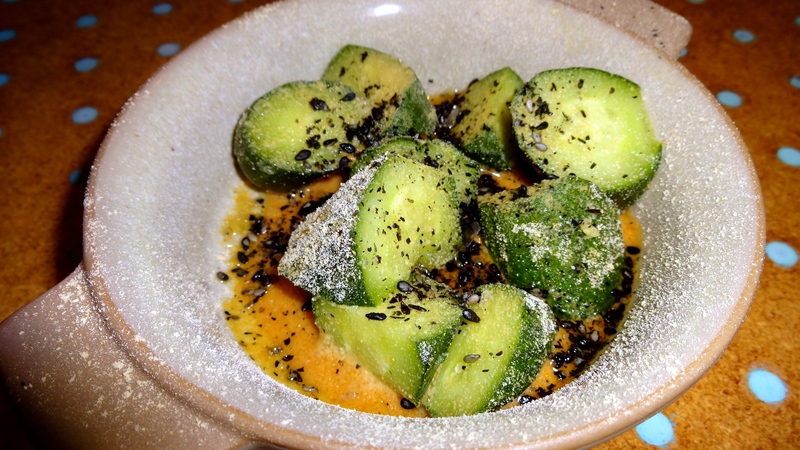 I was so excited to try State Bird Provisions because I had recently watched an episode of Munchies about the restaurant and the husband and wife team who own it. 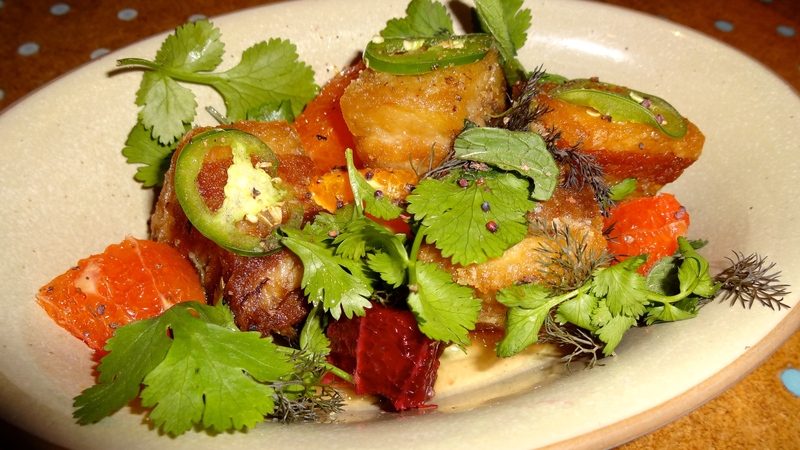 State Bird Provisions is a trendy yet casual restaurant with a funky feel. What’s fun about this restaurant is that not only does the restaurant have an à la carte menu but also dim sum carts! We ordered mostly items off the dim sum carts but also a few of their signature dishes from the à la carte menu such as their mini savory pancakes and the CA state bird, quail. 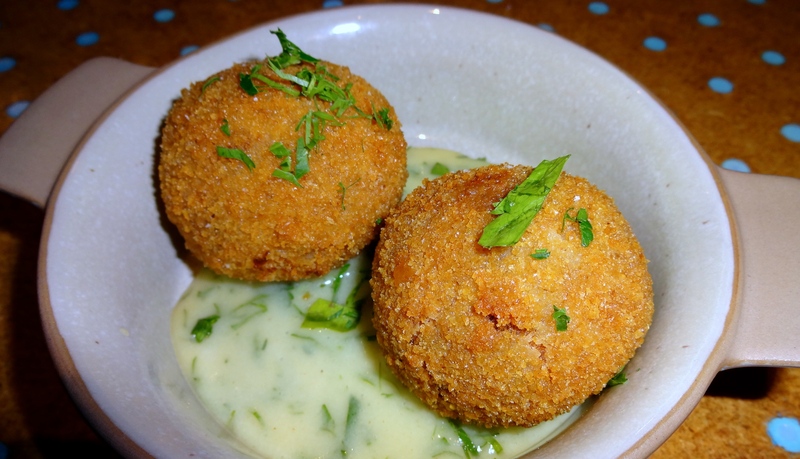 Rabbit Confit Croquettes with Meyer Lemon Aioli (7.5/10). Potato Croquette with Bay Shrimp, Bonito Flakes, and Sweet Sauce (8.5/10). 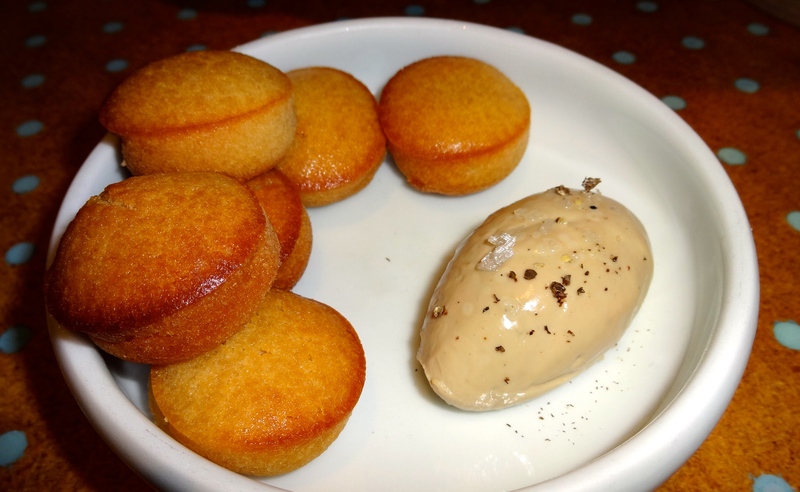 Duck Liver Mousse with Almond Biscuits (9.5/10). 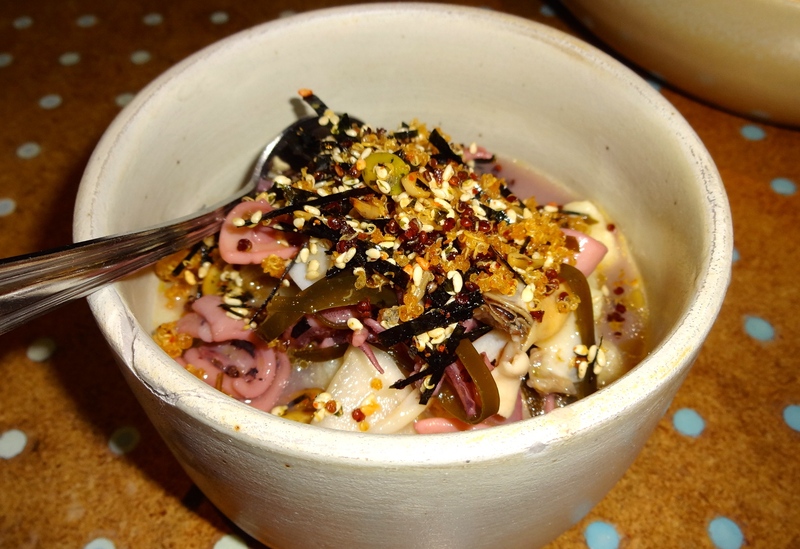 Potato Salad with Pickled Seafood (7/10). 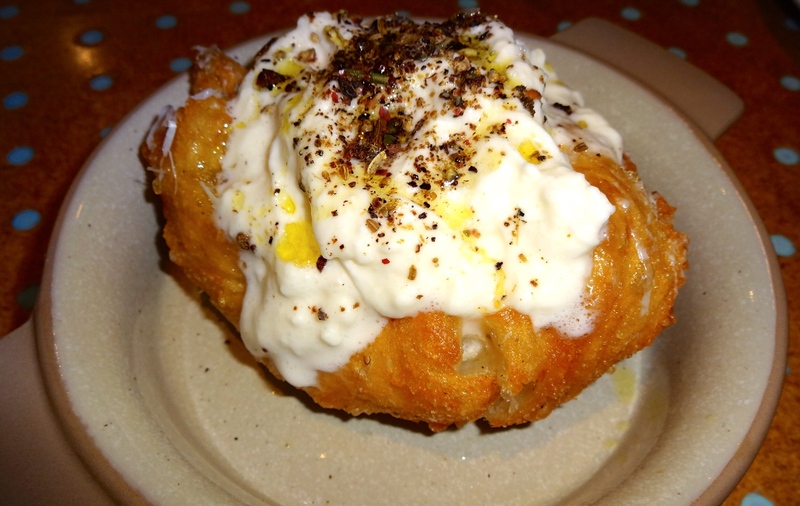 Garlic Bread with Burrata Cheese and Spices (8/10). 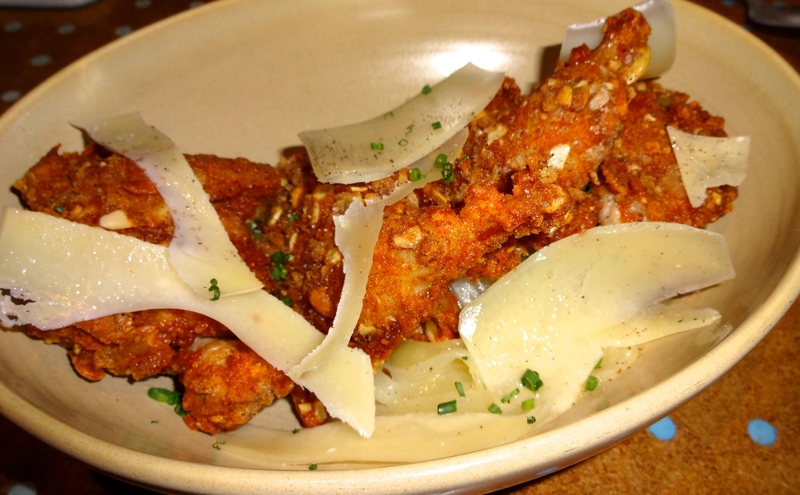 CA State Bird, Fried Quail with Cheese Shavings (8.5/10). 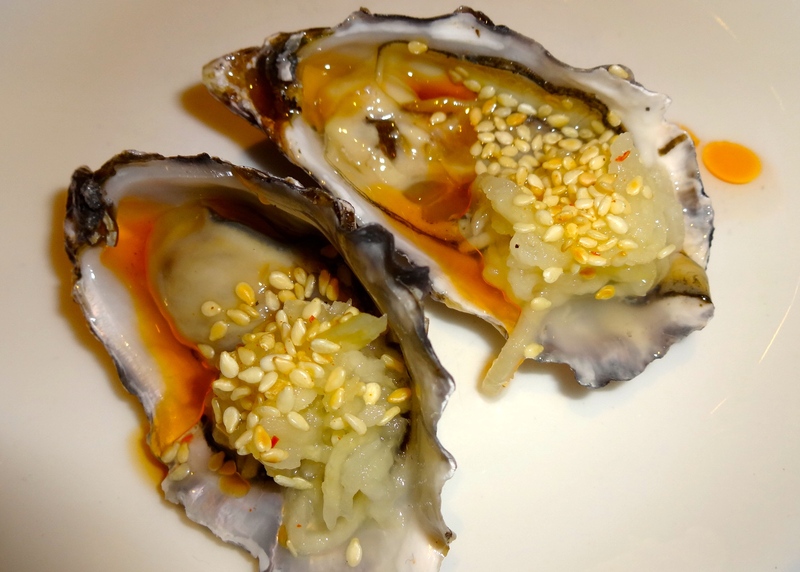 Hog Island Oysters with Spicy Kohlrabi Kraut and Sesame (8/10). Pork Belly and Citrus Salad (7.5/10). 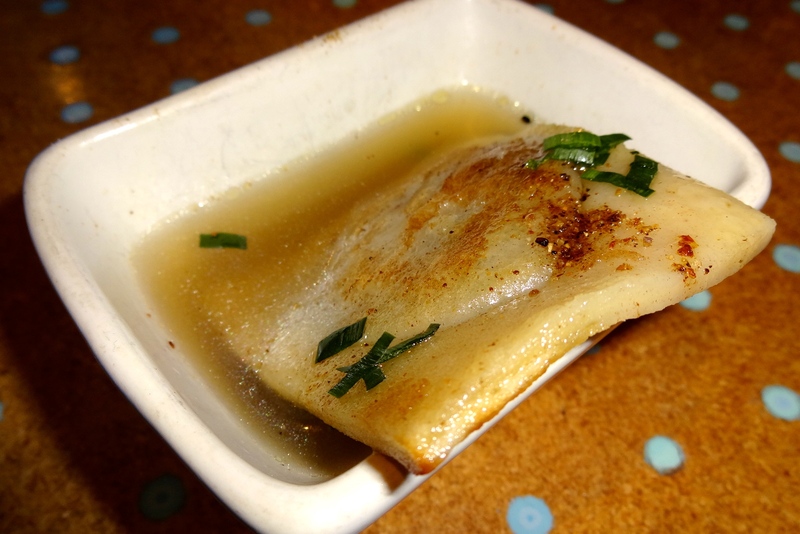 Guinea Hen Dumpling with Aromatic Broth (7/10). 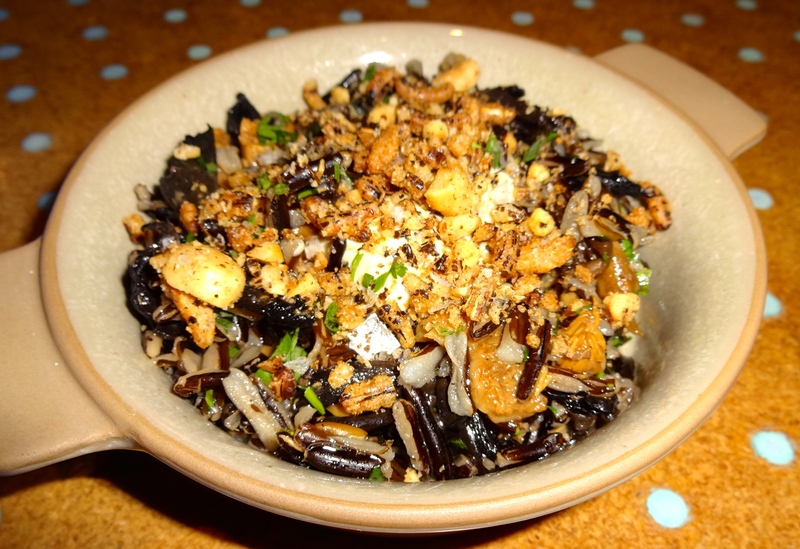 Wild Rice and Mushroom Salad (6/10). Broccoli Cheddar Mini Pancakes (8/10) and Sourdough, Sauerkraut, Pecorino & Ricotta Cheese Mini Pancakes (7.5/10). Steak Tartare Caesar Toasts (8.5/10). 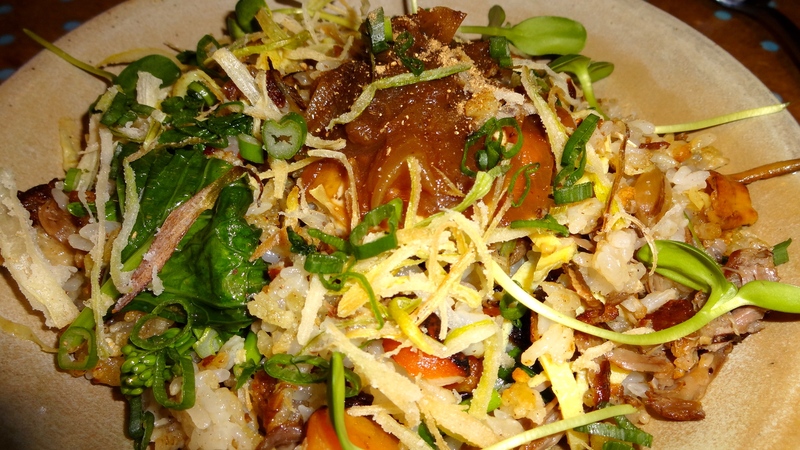 Yellowfoot Mushroom and Duck Fried Rice a la Plancha (8/10). Cocoa Nib and Rose Ice Cream Sandwich with Meringue and Rhubarb (8/10). 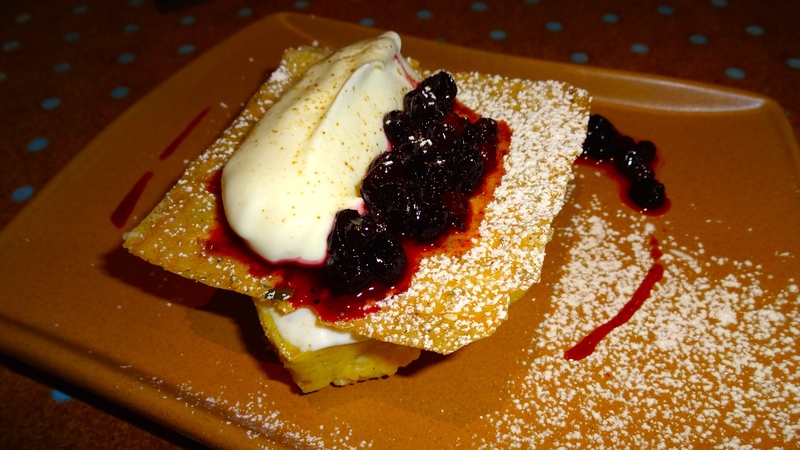 Corn Custard Napoleon with Birdseed Crunch, Yogurt, and Huckleberries (7.5/10). We enjoyed every dish we tried! Since most of their dishes are small bites, you can order lots of different dishes. Some of my favorite dishes of the dinner included the potato croquette, duck liver mousse, bread with Burrata cheese, CA state bird, mini savory pancakes, steak tartare toasts, and the ice cream sandwich dessert. 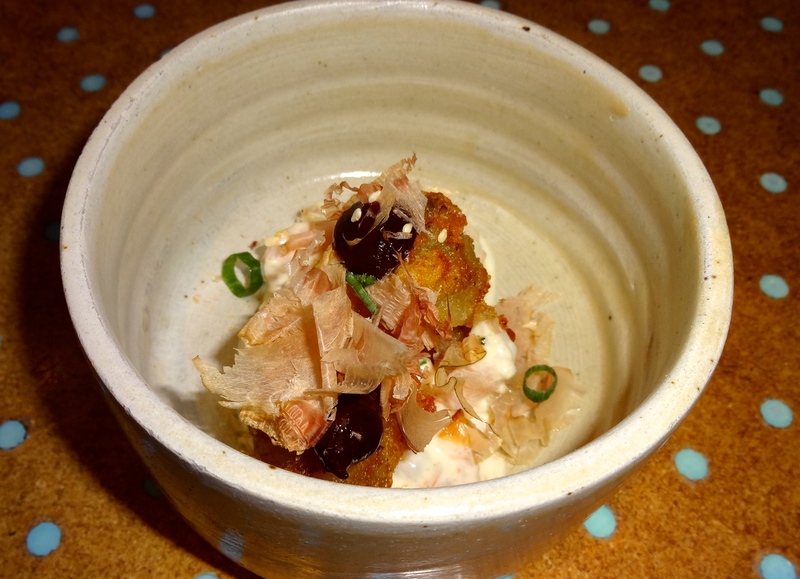 The potato croquette with bay shrimp took inspiration from okonomiyaki, a Japanese savory pancake dish. The dish mimicked okonomiyaki since the bay shrimp were tossed in a creamy mayonnaise and the croquettes were topped with katsuobushi (bonito flakes) and a sauce similar to tonkatsu, a Japanese sweet yet salty sauce. The duck liver mousse was outstanding! The mousse was extremely creamy and smooth and paired perfectly with the airy almond biscuits. The warm bread with Burrata cheese was a comforting dish with soft oozing cheese sprinkled with a mixture of aromatic spices. One of their signature dishes, the CA state bird was another winner. The quail was tender and moist with a tasty crust with stewed sweet onions and salty cheese shavings. 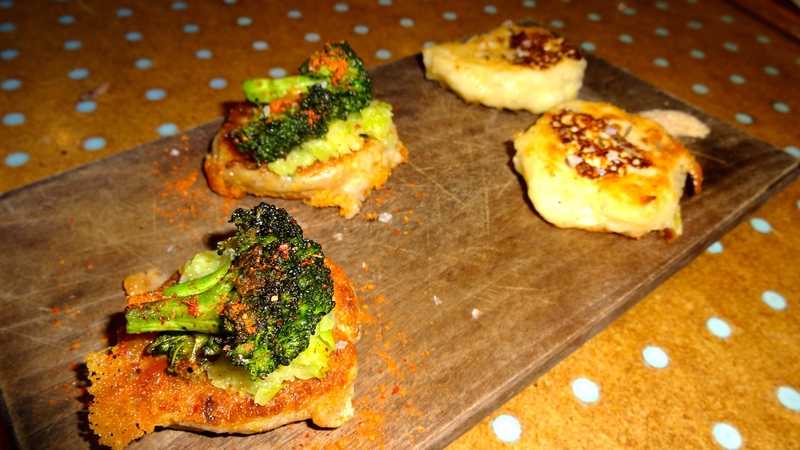 The mini savory pancakes were also delicious, light, and fun to eat. We ordered two kinds: broccoli cheddar and sourdough with sauerkraut and Pecorino and Ricotta cheese. 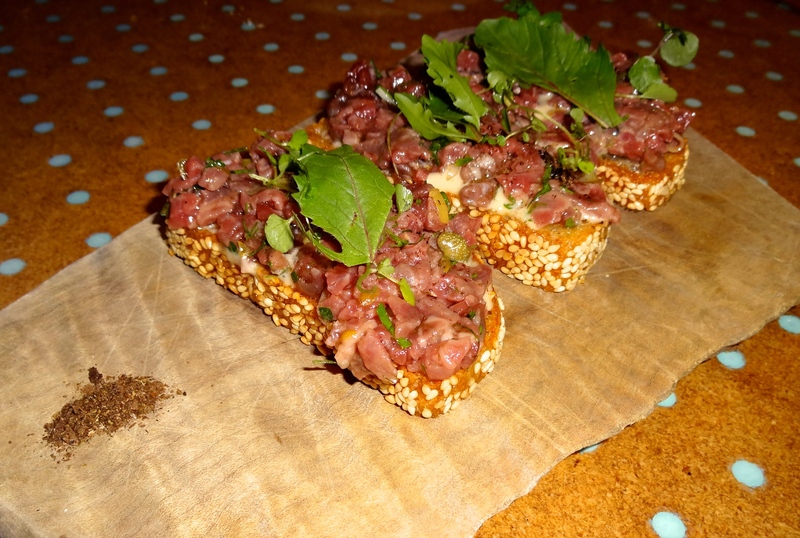 Another tasty dish was the steak tartare toast. Now I’m a sucker for steak tartare so whenever I see it on a menu, I usually have to order it. Their steak tartare toast was so flavorful and had all the flavors of a caesar salad (garlic and anchovies from the dressing). 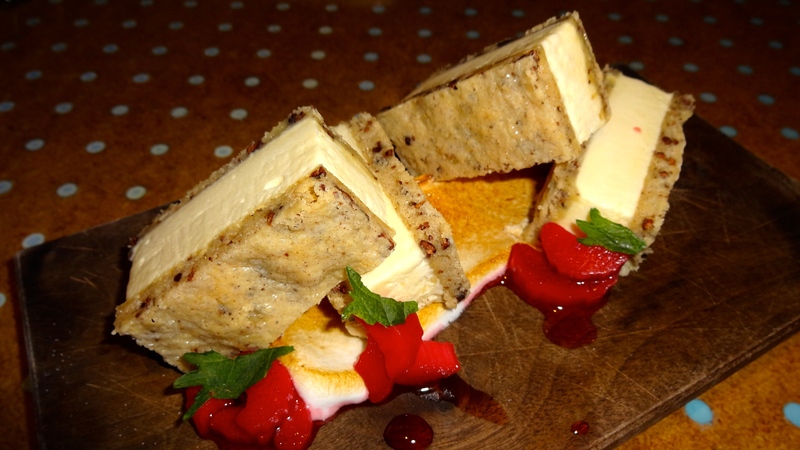 Lastly, the ice cream sandwich was creative and different but also really yummy! Chewy cocoa nib cookies with silky creamy rose water ice cream, brûléed meringue, and sweet yet tangy rhubarb was the perfect way to end a delightful meal. Overall, my experience at State Bird Provisions from the atmosphere and the food was amazing and therefore I’d rate them at a 8-8.5/10. Was it worth standing in line for over an hour? Absolutely if you’re a true foodie wanting to experience fun, creative, and tasty food. Ahhhhh this makes me want to go even more now!!!! Pingback: Review: The Progress. | Sale, Pepe, Amore. Pingback: It’s Official… | Sale, Pepe, Amore. Pingback: Review: The Progress 2.0. | Sale, Pepe, Amore.